To get my UC&C fix at last week's Cisco Live customer and partner event, which primarily focused on networking and security, I headed to the "Collaboration Village" on the expo floor. There I caught up with the following four (new to me) companies. Read on for a snapshot of each company and how it differentiates itself. Founded in 2014, Embrava is a relative newcomer to collaboration. It launched with the mission to solve productivity challenges in the modern workplace -- i.e., open-plan, agile, dynamic environments that have adopted concepts like hot desking and activity-based working. While open-office plans can bring benefits in terms of collaboration, they typically come with frequent interruptions and challenges around finding a quiet space or who's working where. That's where Embrava's sweet spot is. 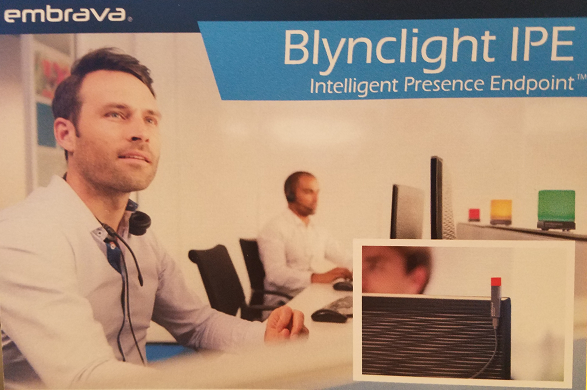 Embrava bills itself as an office productivity company, offering products like its Blynclight intelligent presence endpoints. These devices plug into a user's desktop or laptop to extend provide presence indicators to the physical office environment, showing red when you're busy and green when you're not. Today, Embrava integrates with Microsoft Skype for Business and Cisco Jabber presence systems. At Cisco Live, the company showcased Embrava Flow, technology co-developed with the University of Zurich and ABB Corporate Research that adds machine learning intelligence to the Blynclight endpoints. After observing and learning from a user's work habits – typing patterns and mouse use -- Embrava Flow will automatically turn the light to red when it recognizes patterns that indicate he or she is at a productivity peak. And being integrated with the UC platform, Embrava Flow also dynamically changes the user's digital status. Altogether, Embrava wants to "foster flow at work," the team told me. Embrava primarily serves medium- to large-sized enterprises, and said it is also seeing success in contact center deployments where larger displays, integrated with the same presence lighting technology, can serve as agent name displays and even provide snapshots of the contact center organization. An organization can customize the lighting so that, for example, the color purple indicates that a call requires a manager on the line. Besides the endpoints, Embrava offers the Lumena headset line, with built-in light presence technology. Founded in 2015, startup M.io focuses on making enterprise messaging apps like Cisco Webex Teams, Slack, and Microsoft Teams interoperable. While the team collaboration app market will surely consolidate over time, today's proliferation has given rise to the use of multiple disparate tools within an organization, M.io CEO Tom Hadfield told me during a booth visit. In fact, slightly more than 60% of enterprise IT respondents to our 2018 Team Collaboration Survey indicated their organizations have at least three different team collaboration apps in use (page through the rest of our findings here). This is where M.io comes into play. As this brief demo shows, M.io integrates disparate team collaboration apps so that users can stay in their app of choice, say Webex Teams, but find, chat with, and send files to colleagues in, say, Slack. Not only does this work to eliminate silos and improve organizational transparency, but integrating Slack and Webex Teams, for example, can reduce shadow IT, lead to faster decision making, and allow employees to use their team collab app of choice without compromising on the goal to have unified real-time chat. The M.io admin dashboard provides IT managers a centralized view of the user environment, and allows them to manage everything from permissions to data-loss protection and guest access for the chat services. While new to me, this 30-year-old company has long offered software for customer engagement and case management, as I learned in talking with account executive Gina May at the company's pod at Cisco Live. If you're like me and haven't heard of Pega either, that may be because it lets its clients brand their case management software as their own. 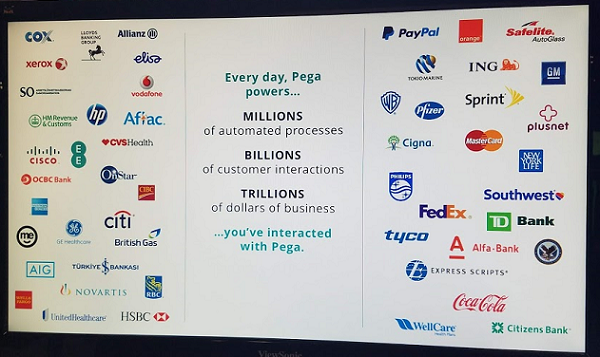 Just a quick look at the below picture will give you an idea of some of the big-name companies using Pega technology. The Pega Customer Service enterprise customer service application is part of Pega's CRM Evolved suite, consisting of a contact center desktop, case management for customer service, chat, knowledge management, mobile field service, omnichannel self-service, and industry-specific processes and data models. At Cisco Live, Pega showcased its partnership with Cisco around integration of its Pega Customer Service application with Webex Teams and Tropo. With Pega Customer Service enabled by Cisco Webex Teams and Tropo, organizations can leverage the team collaboration functionality from within the Pega platform, eliminating the need to replace their existing communication systems, May told me. A customer service rep could open a Cisco Webex Teams room from within the Pega Case Manager and enable all relevant parties to collaborate about -- and even with -- a customer. Using video calling from Webex Teams, they could walk a customer through an issue by seeing what the customer is seeing. With access to Tropo configuration components, business and IT can set things like language for voice recognition and gender of an IVR voice, for example. Stack8, founded roughly eight years ago, bills itself as a full-service enterprise collaboration partner of Cisco, focused on leveraging automation, integration, and consulting services for simplified provisioning around Cisco Webex Meetings and Webex Teams. For example, Stack8 will assess enterprise requirements, set up and test the system, and help manage it for maximum efficiency. At Cisco Live, Stack8 showcased its Intelligent Booking System for reserving meeting rooms, which is part of the company's Meeting Solutions portfolio and uses Cisco's Webex Teams, Proximity, Exchange, and Graph. As Stack8 CTO Eric Losier showed me in a demo, enterprises can automate the room booking process in Webex Teams via the company's virtual assistant bot, called Octo. For example, via an integration with Cisco video endpoints, Octo is able to tell users if a room is free for a meeting. Further, if that room was reserved for an hour but the meeting only goes 30 minutes, Octo can pick up on that unused space and prompt the user to release the room reservation for others to use. Even further, for example, an executive could ask Octo to have fresh coffee delivered to a meeting room, in which case Octo will make a call to an assistant and relay the message. Stack8's flagship product, called SMACS -- short for Stack8 Moves, Adds, and Changes System -- is centered on speeding up to the migration to Cisco UC systems by enabling non-technical staff to handle user provisioning. Octo can come into play here, too, to offload the heavy-lifting of user provisioning from staff.